The FREQ-Seq collection can be used to construct barcoded, locus-specific libraries compatible with Illumina next generation sequencing. By counting DNA sequence reads, this strategy allows for direct quantitative allele detection. This kit consists of one 96-well plate, and will be shipped as bacterial glycerol stocks on dry ice. Samples should be frozen at -80°Celsius immediately upon arrival. Individual plasmids can be ordered at $65 per plasmid, and will be shipped as bacterial stabs. FREQ-Seq: a rapid, cost-effective, sequencing-based method to determine allele frequencies directly from mixed populations. Chubiz LM, Lee MC, Delaney NF, Marx CJ. PLoS One. 2012; 7(10): e47959. PubMed . Open Access Article . The FREQ-Seq collection can be used to construct barcoded, locus-specific libraries compatible with Illumina next generation sequencing. By counting DNA sequence reads, this strategy allows for direct quantitative allele detection. The kit consists of a 48 plasmid adaptor library, with each plasmid carrying a unique barcoded Illumina-M13F bridging primer. 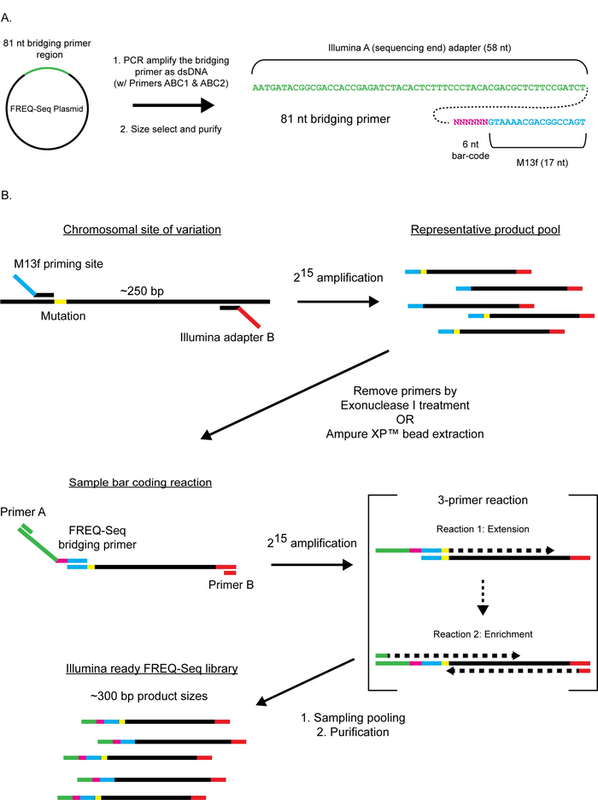 These bridging primers can be amplified and used to generate Illumina sequencing libraries by means of a 2-step PCR-based protocol and are compatible with single-end or paired-end read flow cells. "The FREQ-seq plasmids were a gift from Christopher Marx (Addgene kit # 1000000032)"